Lo-fi garage punk by an international trio of D.I.Y. purists based in Portland, Oregon and Leipzig, Germany. Featuring Szim on guitar and vocals, Chuck Struggler on bass and vocals and Fiona Campbell on drums. Recorded and produced in Clackamas, Oregon by the one and only Fred Cole of Dead Moon (Cole shares a songwriting credit, as well, on Side A’s “Silver Ashes”). While the influence of Cole / Dead Moon / Pierced Arrows is instantly recognizable, Top Down very much remain their own hard-driving musical machine. 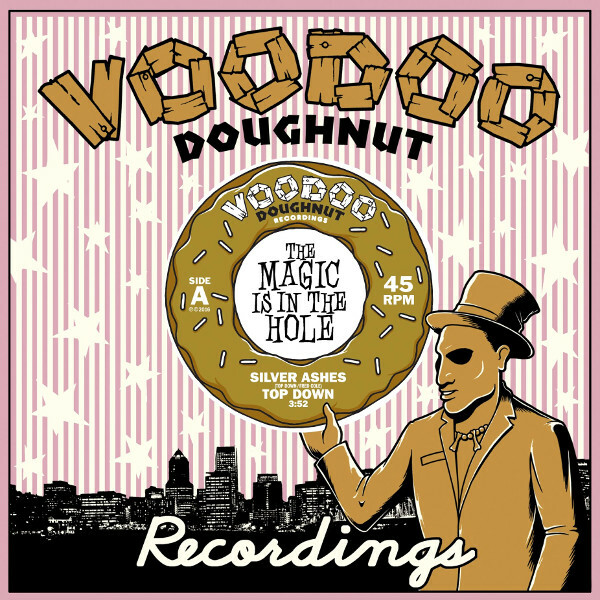 This is the first-ever piece of vinyl from Top Down and the final single in Voodoo Doughnut Recordings’ multi-year series of 7″ releases in custom-made die-cut doughnut jackets. Hand-numbered and limited-edition. Highly collectible!